Andrei Svechnikov took the OHL by storm last season. Entering the league with high expectations, the first overall pick in the 2017 CHL Draft made an immediate impact with the Barrie Colts, scoring 10 goals in his first games. He kept that pace up throughout the OHL season, finishing with 40 goals and 72 points in 44 games to earn OHL rookie of the year honours, as well as the CHL’s top prospect award. If it weren’t for the 24 games he missed due to a hand injury and stints with Team Russia at the World Junior Championships and Five Nations tournament, Svechnikov probably would have exceeded the 100-point plateau. With all of these accolades, it’s easy to see why Svechnikov is considered ISS’s second-ranked prospect eligible for the 2018 NHL Draft. The younger brother of Detroit Red Wings prospect Evgeny Svechnikov, the 19th overall pick in the 2015 draft, Andrei has an enticing combination of speed, power and finesse. His greatest strength is his shot, but he’s also a powerful skater who can stick handle with ease at top speed. Standing in at 6-foot-3 and 184 pounds, he brings a physical element to the game and has gotten under the skin of players at times. Before he came to the OHL, he grew accustomed to the North American style of play by spending the 2016-17 season with the United States Hockey League’s Muskegon Lumberjacks. His 29 goals and 58 points in 48 games led to him winning the league’s rookie of the year award that season. Also that season, he represented Russia at the World Under-17 Hockey Challenge and the World Junior A Hockey Challenge, where he set a tournament record with eight goals. His most prominent stint with Team Russia to date was at the World Juniors, a tournament reserved mostly for 19-year-olds. Svechnikov made that team at the age of 17, and even though his playing time was limited, he still managed to record five assists in as many games. When he returned to Barrie for the second half of the OHL season, he recorded the league’s longest point streak of the season at 23 games, averaging two points a game in that span. He’s established himself as a bonafide scorer, and because of that reputation, his playmaking ability may be underrated. Based on what scouts are saying, it shouldn’t take long for those abilities to translate at the NHL level. At this stage, it’s a foregone conclusion that Svechnikov won’t return to the OHL next year. He could be the first OHL graduate since Connor McDavid to be an impact NHL player in their first year of NHL eligibility. The London Knights captain couldn’t have asked for a better way to break into the OHL. Although he played a limited role on the 2015-16 Knights, he gained valuable experience from being part of a Memorial Cup championship squad in his rookie season. It’s been a steady progression ever since for Bouchard, regarded by scouts as a very smart defender with great poise and vision. This season, his 87 points were the most among all CHL defencemen. He also had a strong showing at the CHL/NHL Top Prospects Game with four assists. One of the highest ranked centres available in the draft, Hayton has developed into a forward capable of excelling in all three zones. He played a secondary role on a stacked Greyhounds squad with several NHL prospects and put up almost a point per game with 60 in 63 games. Hayton put up a similar rate in the playoffs as well with 21 points in 24 games as the Greyhounds, the top-ranked team in the CHL for most of the season, reached the OHL final. At 6-foot-5 and 209 pounds, Noel is a big player with big upside. Given his size and taking into account he’s still likely to put on more muscle as he gets older, he projects as a prototypical power forward at the NHL level. He has a strong shot, as shown by his 28 goals on only 105 shots through 62 games. Needless to say, his size can make him difficult to contain, especially In front of the net. It’s hard to find a prospect in the draft who skates as quick and smoothly as McLeod. Born just a week after the 2017 draft age cut off, McLeod has had three years to develop with the Steelheads and benefited from Mississauga’s run to the OHL final in 2017. In addition to his great speed, McLeod is a 6-foot-2, 205-pound centre who prides himself on his playmaking ability. His older brother, Steelheads captain Michael McLeod, was drafted 12th overall by the New Jersey Devils in 2016. 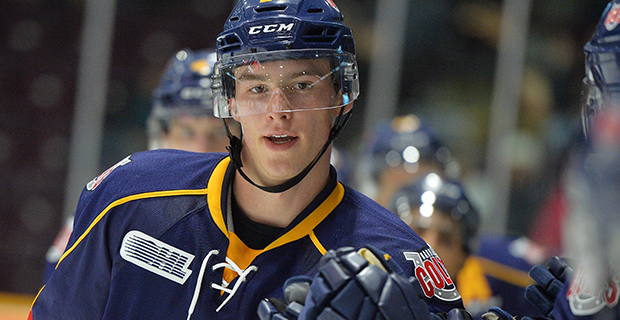 Even in his rookie season, Thomas established himself as Niagara’s most dynamic centre. He followed up a near 50-point rookie season by posting 81 points as a sophomore. Bouchard was the only draft eligible player to record more points in the OHL last season. Thomas has grown into an excellent playmaker and has great speed, but he’s also been praised for his work ethic with the IceDogs. Because of that, he’s earned his way onto the ice in major situations, such as special teams and the closing minutes of close games.